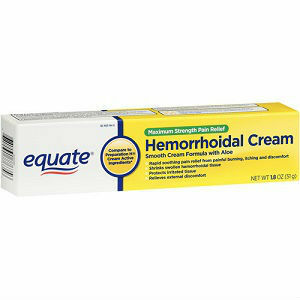 Equate Hemorrhoidal Cream is labeled to protect your skin from increased irritation due to hemorrhoids. By protecting the irritated skin, the Equate Hemorrhoidal Cream aims to keep your symptoms manageable, and includes a local anesthetic to help reduce pain. Glycerin – This ingredient is used to treat constipation, so it may increase the amount of bowel movements taken. Phenylephrine HCl 0.25% – Reduces irritation and soreness, though not specifically tested for effectiveness on hemorrhoidal irritation. White petrolatum 15% – Commonly found in treatment ointments for diaper rash. After cleaning the area, apply the ointment. Children under the age of 12 should consult a physician before use. There is a possibility that this ointment can cause bleeding or allergic reactions. Consult a doctor if conditions worsen, stay the same or side effects occur. During our research on Equate Hemorrhoidal Cream, we were unable to determine a MSRP value for the ointment. There is no guarantee offered with Equate Hemorrhoidal Cream. With the risk of having your condition worsened by the manufacturers choice in ingredients, not offering a guarantee does not help potential customers feel driven to purchase the cream. The Equate Hemorrhoidal Cream may help with temporary relief from hemorrhoidal symptoms, however the ingredients are not clinically proven, and can even cause increased discomfort. With the risk of worsened condition, to not offer a guarantee of any kind is not a good business move. John Parker	reviewed Equate Hemorrhoidal Cream	on October 22nd	 and gave it a rating of 2.0.